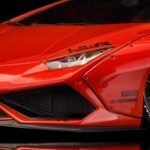 Not everyone is a fan of the work of Kato-San from LB Performance with their LB-Works widebody conversion kits for some of the world’s most special supercars, his style is based on the classic “Zokusha” concept in which owners take their older cars and add wide fenders, deep front spoilers, and large rear wings, to create a unique car on a budget. 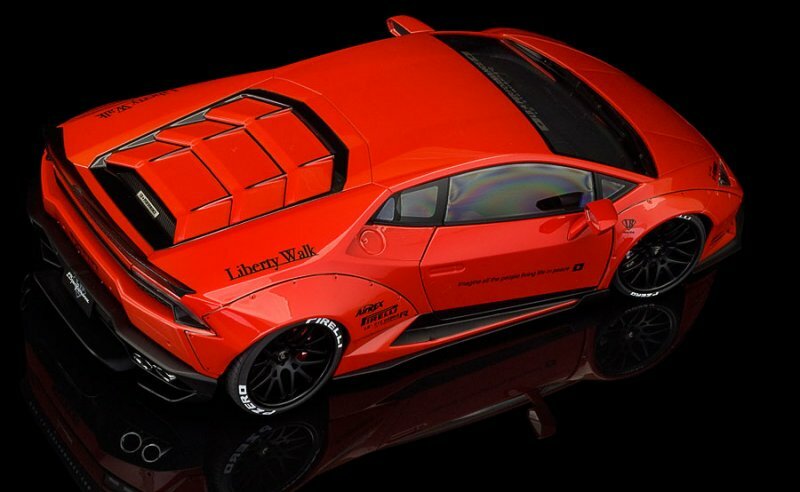 Now we wouldn’t call any of the LB-Works cars to be created on a budget, we are talking about $25,000 and more, just for the kit itself, without fitment and paint, no wheels and no suspension. 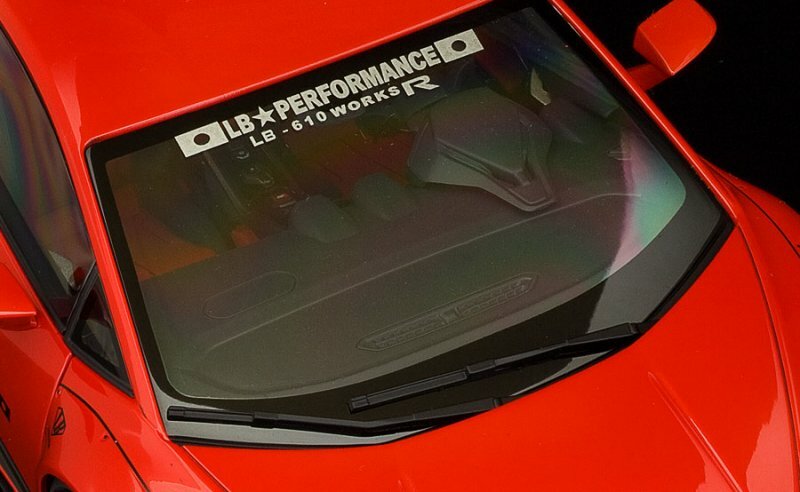 Add in the cost of the base car, and you would be looking at $200k and more easily to own a genuine Kato-San LB-Works product. 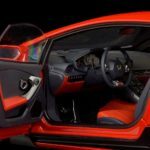 When we look at the Lamborghini Huracan, we can safely say this is the most popular Raging Bull since the Gallardo, the first V10 model from Sant’Agata managed to sell 14,022 units in about a decade, the Huracan has sold over 11,000 units already, and it will be in production for several more years to come, so tuners from all over the world have been creating aero kits for this current V10 model from Lamborghini for a while now. 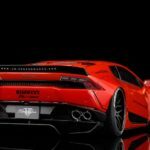 In January 2015 LB Performance published the first renders of their interpretation of the Huracan LB-Works, along with the same lines as their earlier Lamborghini Murcielago LB-Works and the current flagship, the Aventador LB-Works. 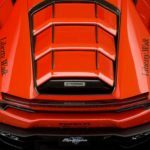 With massive wheel arches added onto the bodywork, a big rear wing, a low front splitter, deep concave wheels, and a super low-riding air-ride suspension, the typical LB-Works touches so to say. 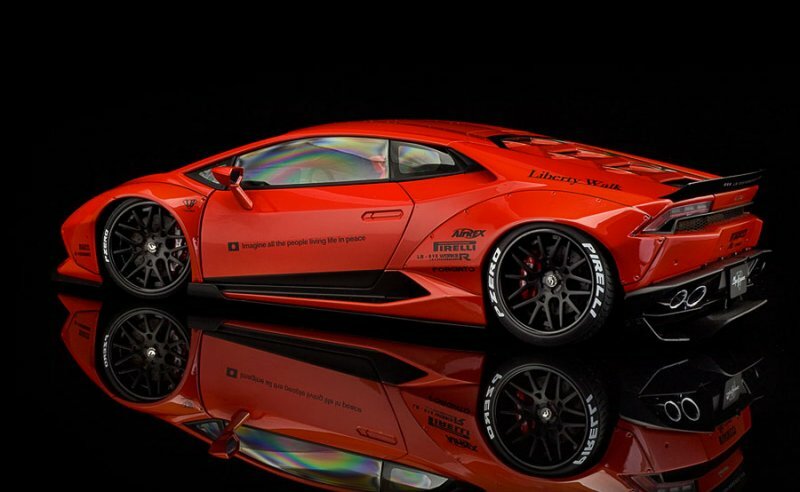 And in spirit with ‘never change a winning team’, Kato-San took the Lamborghini Huracan down the same path, he added four wide fenders onto the body, naturally with exposed rivets (note the first edition of this kit required you to actually cut into the original bodywork of the Lamborghini, today LB-Works comes with ‘exchange fenders’ that just replace the original ones, without you cutting into a $250,000 car), a deep front splitter was listed, new side sills, a lower rear diffuser and different rear wing designs. 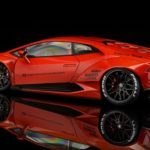 One that looks like a ‘ducktail’ and another one that sits higher up that seems to have been inspired by the Murcielago SV rear wing, which is about $1,500 more expensive. 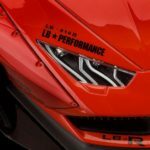 At first, we only saw a few renders from LB-Performance, but a few months later the first actual production version of the Huracan LB-Works was shown in Japan, finished in a stunning red body over black wheels and a black interior, absolutely stunning, and while I might not install an LB-Works kit on my own Huracan (if I could even afford one), I really do admire this kind of tuning, so I wanted to add a scale car to my collection. 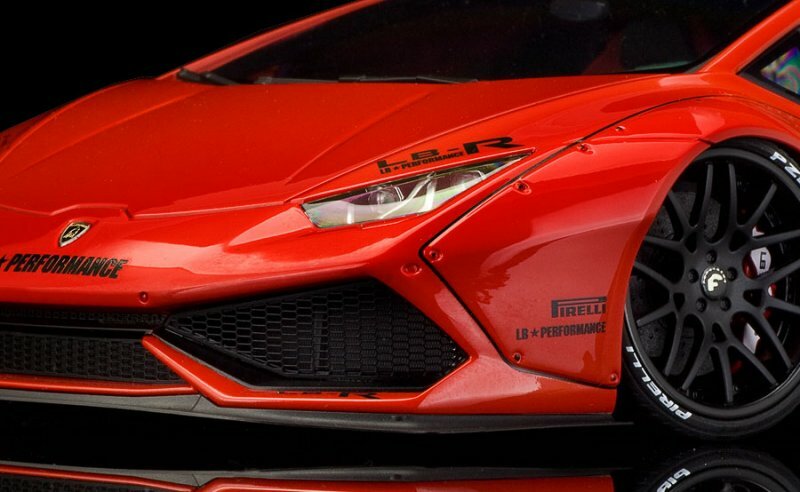 First up came a few resin makes that built the Huracan LB-Works, but at prices that were just totally wrong, later I found a transkit to built your own, based on an AUTOart model, but that would mean paying €200 for the base model, and another €100 to €125 for the transkit, which would require a lot of work and painting. This would make the result come in at €350 or more, suddenly those resin kits didn’t seem so expensive anymore. 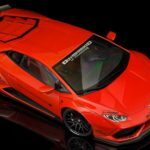 But I had other priorities in getting scale models, so I never got around to actually buying a 1:18 scale model of the Huracan LB-Works … until AUTOart announced they would be releasing it, yes, finally a decent model that wouldn’t be €350 or more but it did come with a downside, only the doors would open, but I didn’t care. On a resin model, nothing opens you know. 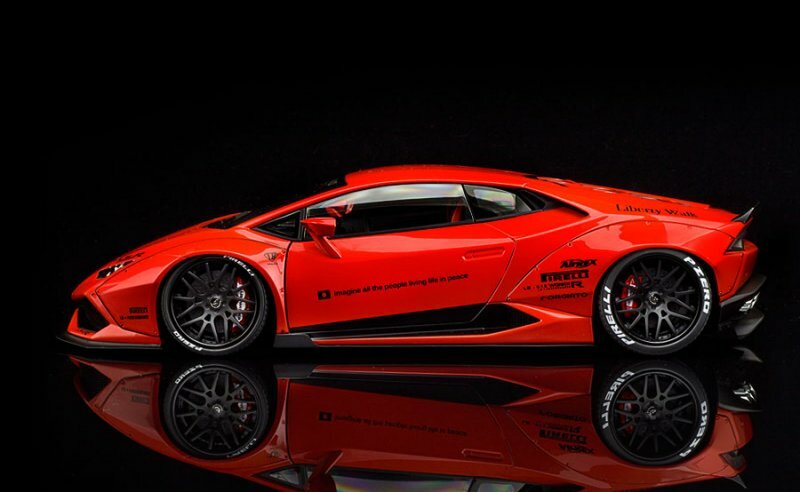 The waiting game started, I specifically wanted the get the AUTOart Huracan LB-Works in red, just like the first real car that Kato-San showed, but that wasn’t the shade AUTOart released first, so I had to wait patiently for it to arrive in Europe, which took a while, and you know I don’t have a lot of patience when it comes to model Lamborghini. 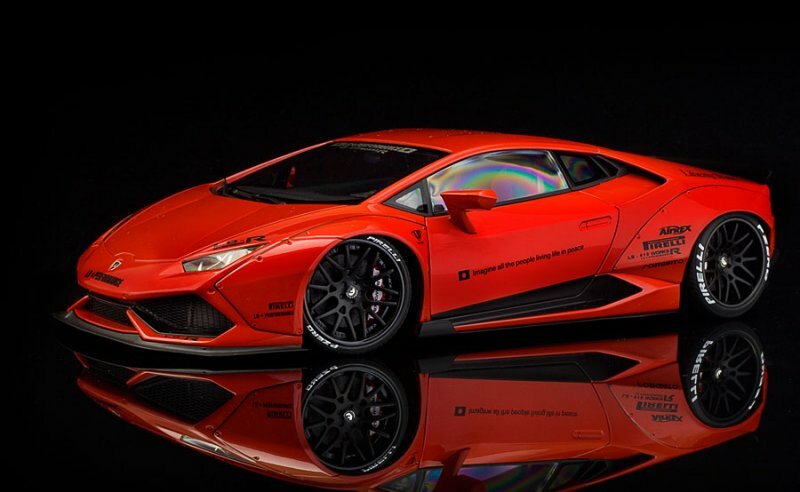 When I finally received the box containing this model I quickly, but carefully, opened it up to admire this Red Bull, it looked absolutely amazing in this shade, and with the low riding height, this is a seriously mean looking Bull next to a standard Huracan. 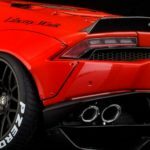 So this AUTOart version of the Lamborghini Huracan LB-Works comes with the low, Version 2 ducktail rear wing, which I actually really like, it also shows the LB-Performance url just like on the real car, similar to the real car, the large Pirelli decal above FI Exhaust logo is also fitted to the rear, above the LB Performance license plate, and while the engine cover doesn’t open on this model, you can actually see parts of the engine through the louvres, which are painted red to match the bodywork, again, just like on the real car. 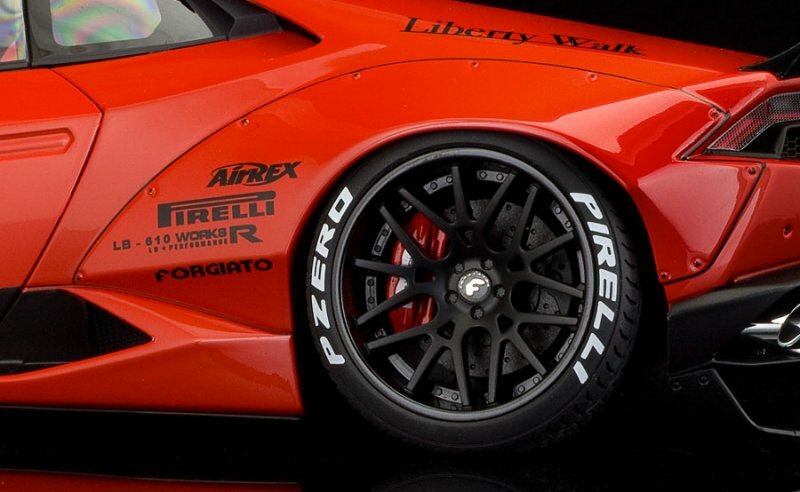 On the side we note the wide wheel arches, but also the rivets holding them onto the fenders are nicely recreated by AUTOart, as is the rubber seal between the extensions and the actual bodywork, a very nice detail, the usual Liberty Walk decal is there above the rear wheel, while the Airrex, Pirelli, LB-610 Works R logo and Forgiatto decals are fitted on the rear wheel arch, the door shows the well-known ‘Imagine all the people living life in peace’ script. 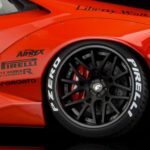 The front wheel arch extension gets a nice LB logo at the top, while up front the Pirelli and LB Performance logos return, also note the stunning side sill, which is sitting very low to the ground thanks to the Airrex air-ride suspension, AUTOart has put the amazing looking, matt black Forgiato wheels with Pirelli P Zero tires nicely into the wheel wells, she doesn’t scrape the pavement, but it’s very close. 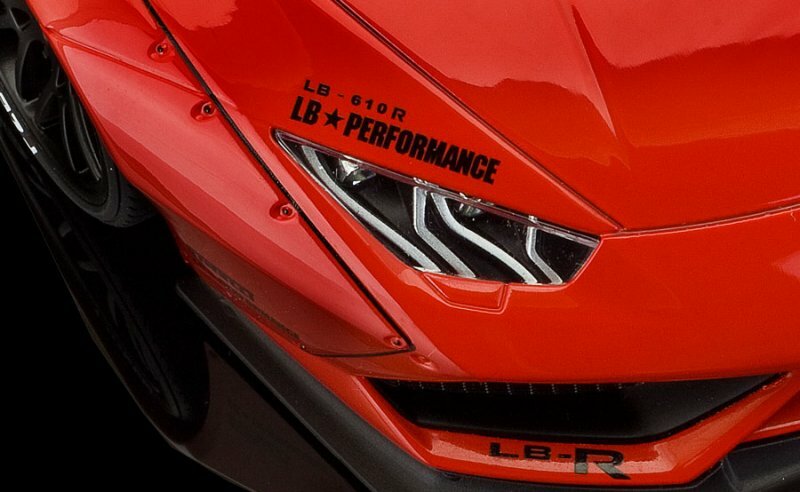 Up front we find the LB-R logo above the headlights and on the air intakes in the original front bumper, on this LB-Works kit there is a big carbon fibre splitter fitted underneath the original bumper, just underneath the Raging Bull crest we find the LB-Performance script once again, just like on the top of the windshield. 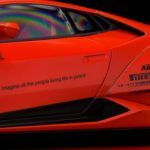 AUTOart really put all the necessary logos and decals on this 1/18 recreation. 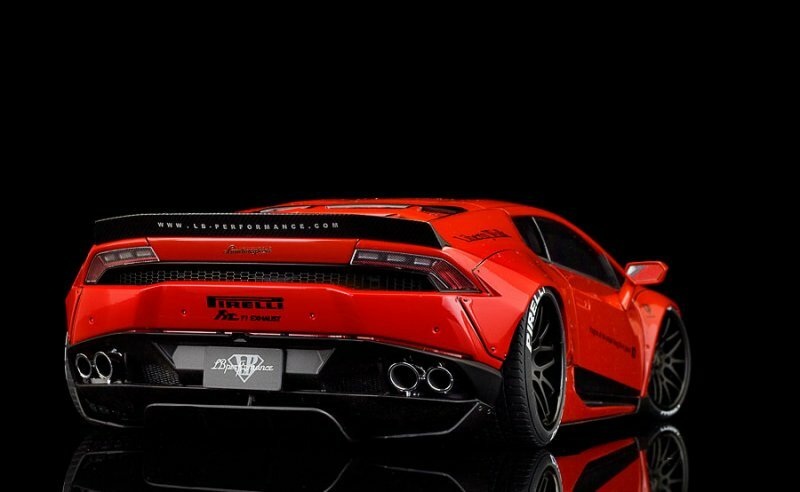 An amazing attention to detail to really create the first Huracan LB-Works Kato-San unveiled in 2015. 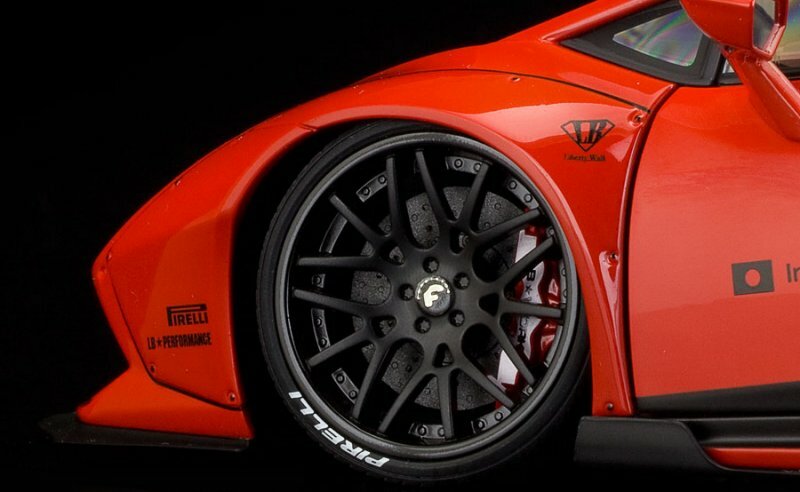 And talking about attention to detail, take a closer look at the brake calipers. 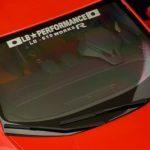 LB Performance changes them in real life too, no longer will you be able to read Lamborghini Carboceramici on these, they now show LB Performance instead. 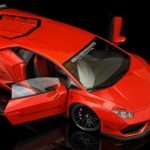 And AUTOart picked up on that for their 1:18 model too, just perfect. 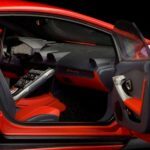 The doors open on this AUTOart model, so we can take a closer look at the interior of the Huracan LB-Works, they went for the Bicolore Sportivo interior, combining Nero Ade with Rosse Alala, which looks really nice inside this red Huracan and that is an exact match to the real car. 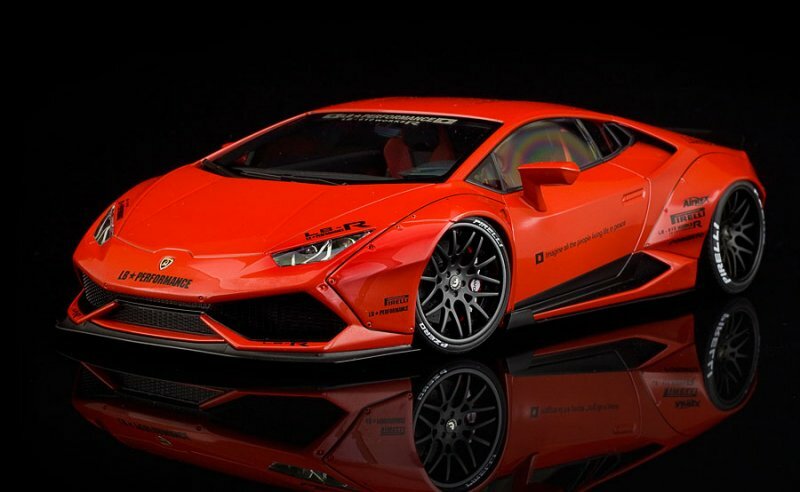 Note that LB Performance didn’t change too much inside their first Huracan LB-Works, so no wild camouflage upholstery or anything weird that was done to later cars, so in fact, this AUTOart version is an exact replica of the very first Huracan LB-Works presented in 2015. 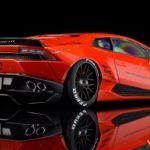 Do note that later on Kato-San showed the Version 1 rear wing on a red Huracan LB-Works too, but that car also featured different decals and different wheels, and while we are at the subject of wheels that is the only mistake AUTOart made. 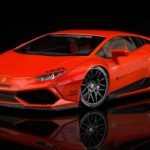 The wheels on this scale model are actually those from the second red Huracan LB-Works shown, deep concave cross spoke wheels. 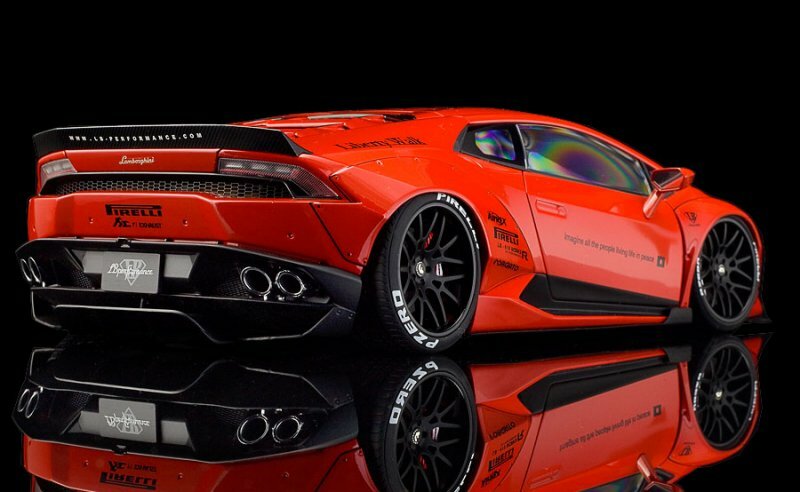 I love them, they look really nice, but the very first Huracan LB Works was shown with 10 spoke wheels instead. 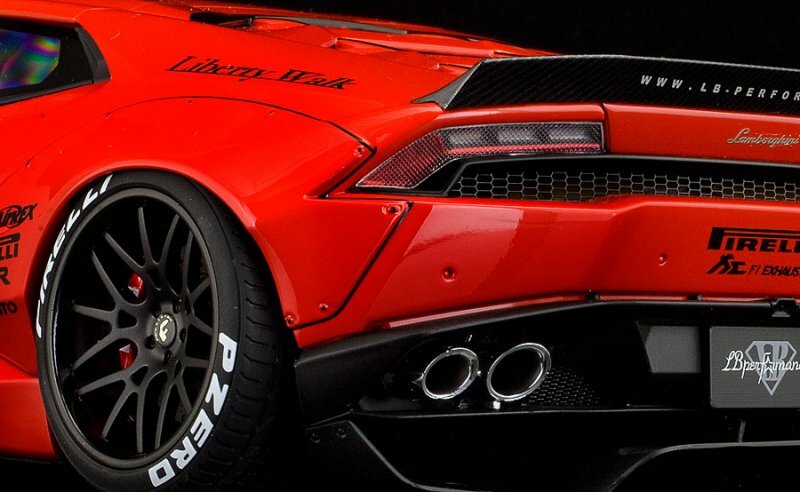 They are not really correct, but there is a red Huracan LB-Works with these wheels in real life too, and as I prefer these cross spokes anyway I’m not going to make a big deal about it. 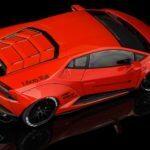 I am really happy with this 1:18 scale model of the Huracan LB-Works by AUTOart, I paid €159 for her, which is a whole lot less than buying a base Huracan, buy the trankit, build and paint those and end up at €350 or more, or one of the MR made ones at €400. And while we’re at it, those stupendously expensive D&G models, I still wonder who buys those €1,000+ models anyway. 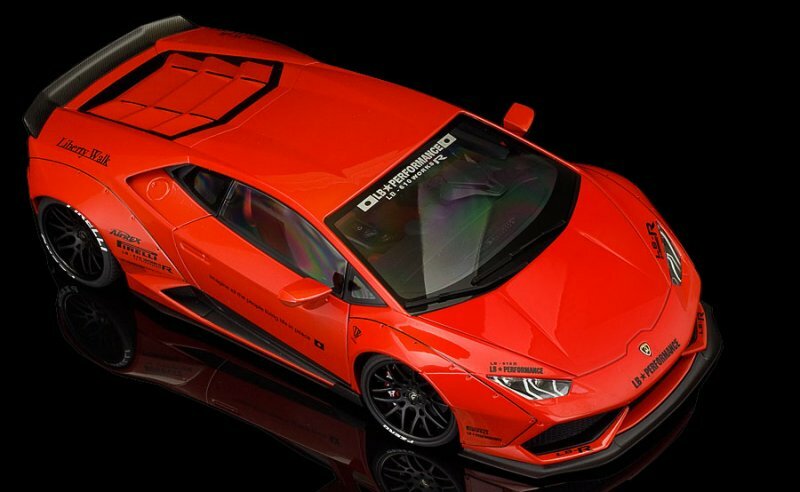 So back to this €159 AUTOart model, sure only the doors open, but I’m not paying a €200 premium for a model that has full-opening features, I have a few AUTOart Huracan, so I can admire the engine and luggage space on those, and I’ll admire my red Huracan LB-Works only the driver door open. I surely can live with that. 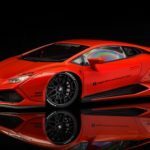 AUTOart released this model in five different shades, Matt Black, Glossy Yellow, Glossy White, Glossy Blue and this Gloss Red, I specifically wanted this red shade to mimic the very first Huracan LB-Works shown to the public. I have to admit it looks great in the other shades too, especially that blue will have a nice shelve presence while black will be intimidating beyond belief but we can’t buy them all, so I for one am extremely happy with my red one. 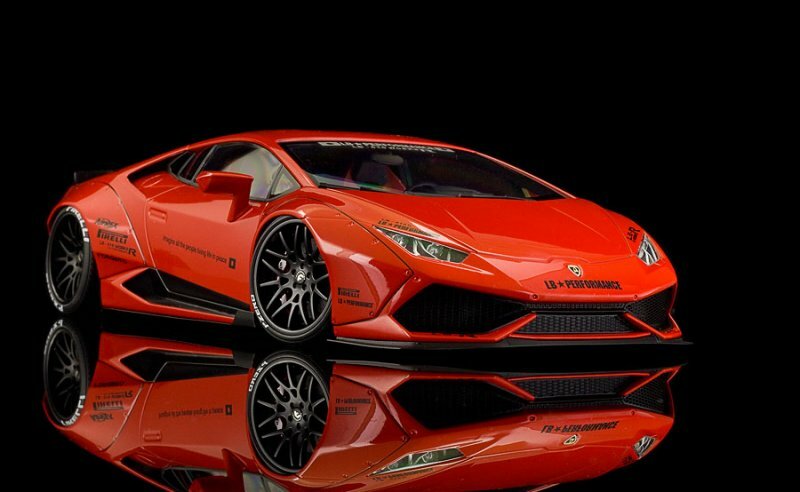 3 Responses to "REVIEW: AUTOart Lamborghini Huracan LB-Works"
Nice review sir! This model does photography well, but when you see it first hand it is somewhat less desirable from a tactile perspective. 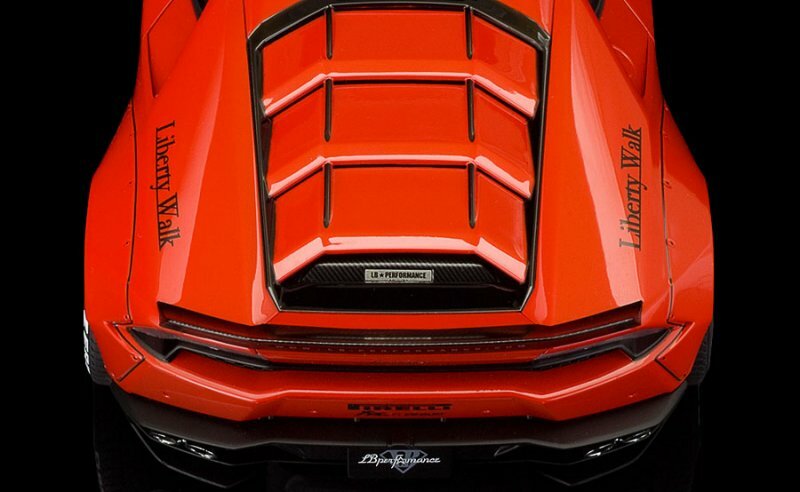 I hate the fact that AUTOart doesn’t go the extra mile with motor and front storage access. 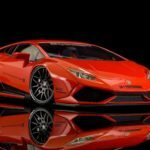 This car in red looks great in photos.. But in hand, it’s nothing more then a toy. 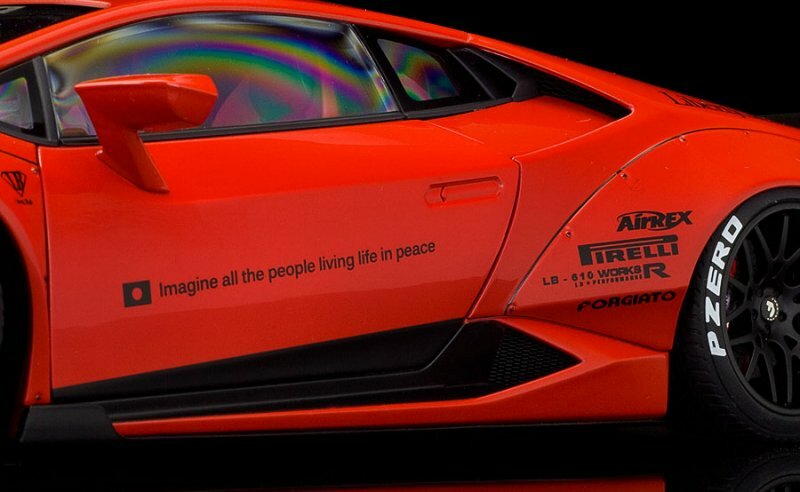 The OP listed multiple manufacturing companies that make this piece. Yes, those prices are outrageous. 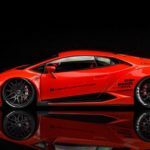 But the OP did not mention Kyosho GT Spirit. They produced 500 of the LB works in brilliant yellow. I have this particular piece. It’s absolutely stunning. And even better news.. I paid $120 for it. 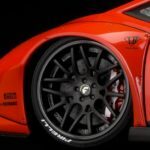 Those brakes are absolutely cheap plastic pieces!